Happy Monday everyone! I literally wore this exact same outfit two days in row last week, that’s how much I loved it! It’s the perfect ensemble for the transition from spring to summer! Awww! You look majestic in this gorgeous outfit! Love the baby doll dress, it suits you perfectly! You are looking gorgoeus, as always! I use the 50MM 1.2 lens! you look absolutely gorgeous in this outfit! The dress is stunning and I love your sandals! Such a cute dress, why not wear it more than once! That dress could not be more perfect. I love the high neck detail. On your snap, you guys had Dasher combed out really well! We just got a Golden Retriever puppy; what kind of brush/comb did you use? We use the Furminator brush from Amazon! I CANNOT live without our Furminator! So in love with this look on you…one of my favorites for sure! It’s such a pretty dress!! My weekend was awesome, I wrote a little bit about it on my blog. Hope you had a great weekend, too!! Thanks Amber!! Loved your post today. Which prime lens did you get?! New tech accessories are so fun to test out!! Such a pretty dress! My weekend was good… I wrote a bit about it on my blog. I hope you had a great weekend, too! It really is a great look to transition from Spring to Summer! So cute! It’s such a lovely outfit!> You’re stunning! I love the lace/embroidery on that dress! You can’t go wrong with white dresses! You look gorgeous! Love the dress and shoes so much! And the light in these photos are amazing! Love that dress with the wedges! This is such a great look for summer. Your dress is so dreamy and gorgeous! It looks sensational with these sandals. Amazing as always! Love this look! So simple and put together. 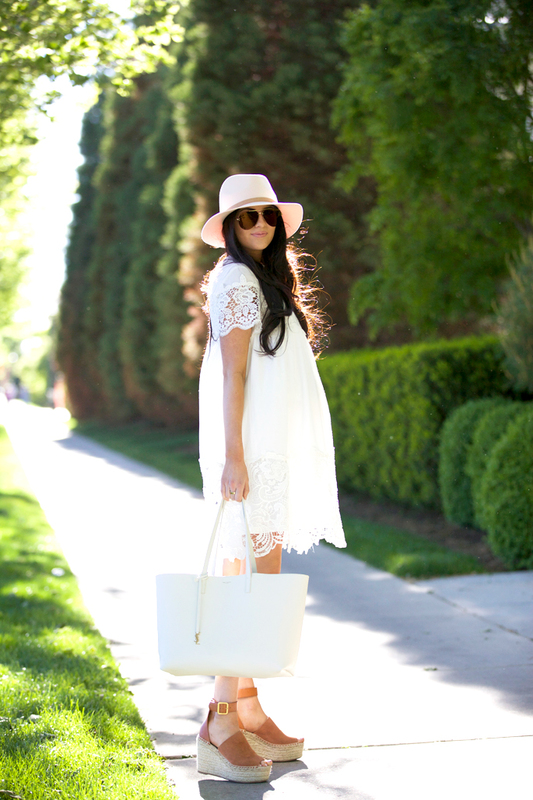 Love the all white look with your tan wedges, so chic! Time really flies…can’t believe you’re showing already! I still remember when you were pregnant the first time :) A beautiful mama! I hardly ever comment on your blog, Rach, but I must say that this is such a lovely look! I hope to see more “flowy” looks and dresses for your maternity style instead of pencil skirts. This dress is so cute. I’m bummed that ASOS sold out. Hoping they’ll bring it back! Oh my gosh thank you so much for commenting!! I love hearing from my readers. I’m loving flowy dresses right now. I’m sad its sold out too, but I did include some similar dresses! Such a lovely summery outfit! Looks gorge! Such a lovely dress – love the lace detail! I love this look! I don’t blame you for wearing it twice, I sometimes do that with outfits that are only worn for a few hours at a time that I really love. ;) I think this just proves that a pretty dress doesn’t have to cost a fortune! I looked it up when you shared it in your gender reveal and it was still in stock. I remember it being around $50. It doesn’t make sense to invest in expensive pieces while pregnant, I did the exact same thing with I was prego but just love your picks! So true!!! Thanks so much for stopping by! love those wedges! so fun! I love this look so much Rach. You’re blooming like the peonies. Love the look, great dress. Cool shoes! Your baby bump is adorable! You look stunning as always! Would you mind sharing what color that hat is? Thanks so much! Is the Rag & Bone hat you are wearing in this post the silver/grey color or the shell color? Cant tell from the lighting if it has a touch of pink to it. Thank you! Where are your amazing sunglasses from!? Love the size of them.